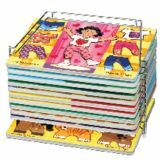 Holds 12, 9" x 12" puzzles. 12 1/2" x 10" x 7 1/2". 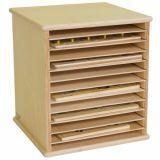 Versatile, portable storage of 12 puzzles or remove 6 shelves and store 6 knob puzzles. GREENGUARD® Gold certified. 15 7/8"H x 14 3/8"W x 14"D. Weight 27 lbs. Additional shipping charges apply.